East of Coker moves through London and Iraq that shadows TS Eliot’s waste land, asking what duty do those left behind have to those that would otherwise be forgotten. How, through acceptance of what we have done, we define who we are, where we are all inevitably heading to, and what happiness can be found. Andy served in the intelligence corps of the British Army reaching the rank of Captain. He completed operational tours in Northern Ireland (2003), Iraq (2004), Basra (2005) and on specialist intelligence duties in Helmand Province, Afghanistan in 2007. 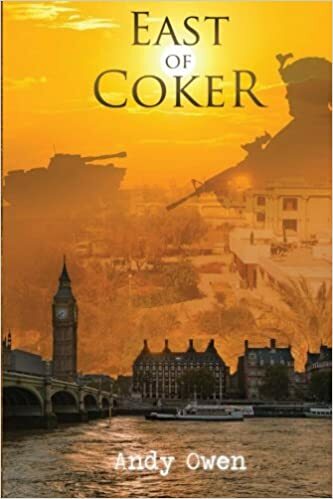 East of Coker is his second novel following Invective (2014). He now lives in London. Andy writes for the War Writers’ Campaign which is an amazing campaign who supports and promotes social change surrounding veterans issues through written awareness. The War Writers’Campaign aims to maintain a long term and historic platform that facilitates the consolidated efforts of service members and veterans to promote mental therapy. It helps to assist veterans in telling their own story. Engage in the power of therapy through communication and empower the next greatest generation of veterans through written publications. East of Coker is available here.